The year 2000 co-channel season is coming! The year 2000 co-channel season is coming! With increasing number of complaint calls the pressure is rising on the head-end technician to eliminate those annoying Venetian blind-type lines on the affected channels. The interference elimination process should start with a computer generated Co-Channel Signal Direction Sheet, exhibiting the precisely calculated directions and distances of the desired and undesired stations. Without the correct information the interference identification task may become a tedious and inefficient procedure. 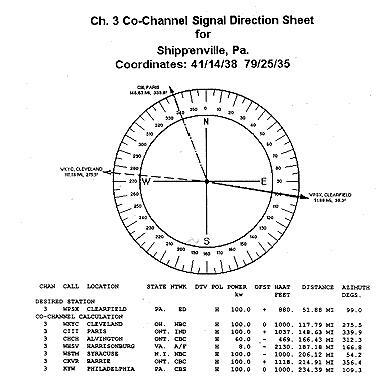 The Channel 3 Co-Channel Signal Direction Sheet, as well as the tabulated listing below identified two dominant offenders: Channel 3, Cleveland and Channel 3, Paris, Ont. The quasi equidistant offenders operated with full (100 kW) radiated power. Question: Which one was the dominant interference source? Only a rotor mounted search antenna was capable of providing the proper identification. The identification of the dominant co-channel interference is a straight forward process. The search antenna can be put into service when any of the tower-mounted antennas or antenna-arrays malfunction. Does your pictures exhibit ghosting? Use the search antenna to determine the direction of the reflection source. Is a recently installed antenna delivering lower than expected signal levels? Compare it's performance with the search antenna. When electrical (AC) interference flares up on any of the low-band channels, use the search antenna to determine the direction of the AC interference source. The above inexpensive VHF-UHF antenna, designed and manufactured for rooftop installation purposes, will not last long on the top of the CATV antenna tower. At a height of 150’ or 200’ above ground, exposed to strong winds, snow and ice, the flimsy VHF elements may last six months or less. Despite the nationwide electronic store's claim of 180 miles VHF and 90 miles UHF range, this and other multi-element models have a very limited and uneven antenna-gain performance, exhibiting low Front/Back ratio and fast changing sidelobe patterns. enhanced by flat frequency response over the entire VHF and UHF spectrum. Back in the late sixties and early seventies a frat effort was made to develop the “perfect” search antenna. CATV operators accepted the new log-periodic model with great enthusiasm. 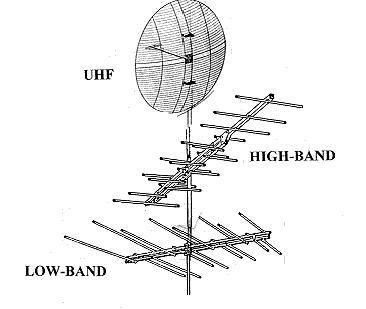 The above depicted VHF-UHF search antenna, developed in the late sixties, is still sold in its original version. Unfortunately, no upgrading was made in the past 30 years. The antenna lacks gain on UHF. The UHF radiation pattern deteriorates dramatically toward Channel 17 and Chan-nel 67. The strange looking reflector element in the back should enhance the Front/Back ratio per-formance on low-band. The antenna’s Front/Back ratio is less than adequate on Channel 2 or Channel 3. On a number of VHF channels the radiation pattern of the antenna falls short of the desired, reducing its value as comparison (reference) tool. A more elaborate but unquestionably more efficient Search Antenna installation is shown above, composed of three antennas. The Low-Band, High-Band and UHF reception was divided between individual high-gain, high-directivity antennas, designed specifically for the reception of the 54 to 88 MHz, the 174 to 216 MHz and 470 to 800 MHz frequency ranges. There is no design com-promise. The 10 foot antenna mast, installed on the top of the rotor, provides adequate separation between the individual antennas. Once employing the L/H/U search system, head-end engi-neers would never consider again the 30 year old, compromise performance single antenna.